The app we've all been waiting for since this summer is finally here! Carbon for Twitter was added to the Google Play store this past Sunday night and while we in the states were overwhelmed with the Super Bowl and Beyonce, the rest of the world rejoiced with this long awaited release! A wide open, simple layout. The only icons showing when the app opens is a small bar on the bottom, giving you the option to add a new tweet, go to your profile, or open up the settings, which is just another slim bar up the right side. Swiping across to see your mentions and direct messages is quick and easy. You also can see where you are by sleek-looking blue bar on top of the app. On the timeline you can pull to refresh, bringing up an obvious swivelling in "Refresh", but what is very fun here is if you find yourself just too many tweets away from the top, a two-finger scroll will bring you to the top of your timeline. This is a huge draw for Carbon. When you pull to refresh, your whole timeline pulls with your finger in a very Star Wars-y way. 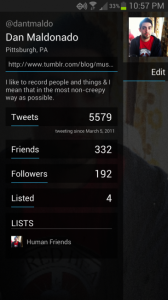 Touching your profile image brings up your profile info from the bottom up (and also back down). Even the new tweet button drags itself up to the front in such a way that is just different from any other app we've seen yet. Going into a twitter conversation and scrolling down to see the previous comments makes your original tweet skew up to the right in the background. Scrolling back down brings it back to the front. Some pretty imaginative stuff! These are represented as two different entities. As you long press on a tweet, you can now directly quote a tweet instead of having to hit retweet and see the retweeting options. When you quote, it even puts RT in for you! Retweeting is a separate button in itself and does just what is says. A more in-depth notification setup. As of now, you can only turn your mentions and direct messages on or off. Editing them is just not here yet. There is only one set time interval for how frequently the app updates. The icon in the notification bar could be a lot nicer! This is really a must have by now. Although the new twitter client comes off very minimalistic and lacking, its simplicity is what makes it so great. The timeline screen gives you plenty of space to view your tweets (what it's there for!) and the actual tweets themselves are nice and big! The tweets are on a smooth black background which give them a feeling that they're floating and not confined to individual boxes. The profile page isÂ laidÂ out like a pathway to another area as I usually find myself doing. The screen is broken up into an odd proportion that doesn't make me want to stay on it for very long and just get on my merry way. Carbon is a whole new way of thinking about a Twitter app, bringing looks and transitions into the same amount of importance as the information. One of the greatest things about this release is that are seeing some branching out in the way these clients are being developed. Although there are some features that need to be brought and implemented, and being in heated competition with other new..."birdish" Twitter apps, Carbon does have some work to do. Â Yes, we did wait way too long, and the line of communication was deceiving at times, but this new Twitter app brings it and best of all....its FREE!